Our local library sells issues of old magazines for 25 cents each. I rarely buy them since I have free subscriptions to several magazines and am usually behind on reading them! However, if I spot any Reiman publications, I will purchase those and peruse the recipes, looking for a new one to try. Just recently I found a recipe for Cheesy Beans and Rice in the February/March 2002 issue of Light & Tasty. I made some changes to the original recipe, adding sausage and using homemade kidney beans I had in the freezer. The first version was a bit too spicy, even for me – and I usually like spicier foods. From now on, I will use mild Ro-tel; however, if you want the heat, you can use the original Ro-tel. Cook rice according to package directions. Transfer to a bowl; add the beans. In a nonstick skillet, heat olive oil and butter. Add onion and saute for 2 minutes; add sausage and saute another 2-3 minutes. Stir in the tomatoes and chili powder. Bring to a boil; remove from the heat. In a greased 2-quart baking dish, layer half of the rice mixture, one half cup of cheese and half of the tomato mixture. Repeat layers. Cover and bake at 350 degrees for 25-30 minutes or until heated through. Uncover; sprinkle with remaining cheese. Bake 5 minutes longer or until cheese is melted. More delicious recipes can be found at Tasty Tuesday and Tempt My Tummy Tuesday. I LOVE beans, and LOVE new recipes with beans, this looks great, thanks! I love beans and rice recipes. This one sounds really good! 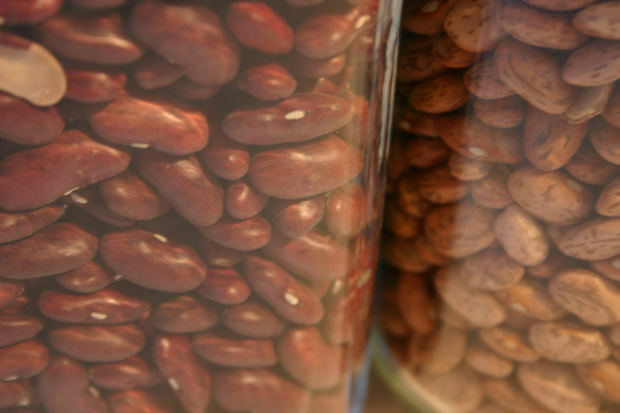 Beans are so full of fiber – this looks look healthy and delicious! This looks like something that we would really enjoy. I bet the leftovers are good too.